Six student leaders and a staff advisor from Southern Illinois University Edwardsville attended the annual Illinois Residence Hall Association (IRHA) conference held Feb. 17-19 at Eastern Illinois University. The conference engaged and united Illinois students with a weekend of leadership activities. This year’s IRHA conference theme was “The Places They Will Lead!” SIUE attendees included Alex Orban, of Streator, Wayne Sherland, of Swansea, Alexandra Smith, of Cowden, Kenneth Tolliver, of Zion, Eric Arnold, of Alton, and Sean Whitmore, of St. Peters, Mo. The SIUE delegation won the title of Most Spirited Small School during the conference. The students’ staff advisor Christine St. Louis, interim community director in University Housing’s Cougar Village, presented at the conference. Her presentation, Melting Pots and Salad Bowls, was recognized as one of the Top 10 Programs of the conference and received the People’s Choice Award. The program challenged students to think about how cultures relate to one another and the cultural differences that exist as part of a campus environment. For more information on IRHA, contact Christine St. Louis at chstlou@siue.edu or 618-650-2965. 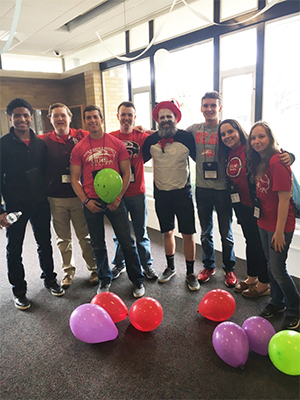 Photo: SIUE student attendees at the Illinois Residence Hall Association conference included (L-R) Kenneth Tolliver, Sean Whitmore, Wayne Sherland, Eric Arnold, Dr. Suess’s Cat in the Hat, Alex Orban, Christine St. Louis, Alexandra Smith.